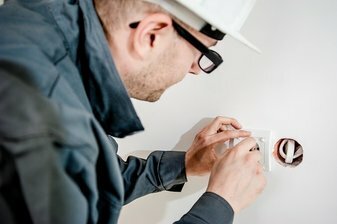 If you need a reliable Croydon electrician for your domestic, commercial or even industrial project then you should definitely consider us. We offer excellent professional services with trained, certified and vastly experienced staff in all kinds of projects. We are sure that if you need an electrician Croydon Vic, then you can count on us. Most people only think they need a sparky when there’s a problem. But this isn’t necessarily true. It’s pretty important to plan ahead and have your electrical systems maintained and checked for faults. It’s a service we provide and something we pride ourselves in being able to do is spot and resolve future problems. One of our common fixes for avoiding future problems is replacing older switchboards with modern switchboards. Obsolete switchboards can trip frequently because they’re not capable of dealing with modern demands. We can install modern switchboards with safety switches that can eliminate the potential for fires or electrocution. We can also repair and maintain existing modern switchboards. Our electrical services Croydon also includes residential, commercial and industrial services. Of course, if you do have problems then you should definitely consider us as we’re great at problem solving. We have extensive experience in electrical testing for businesses and households. We’ve been working as electricians Croydon, for many years and there’s no problem we won’t be able to solve with your lighting or wiring system. Our technicians have all been certified and have completed the necessary practical hours to be able to be at the top of their game. Once we identify the type of work that needs to be done we’ll send the technician who has specialization in this field. And all of our electricians have insurance that covers them as well as any third party like yourselves. It doesn’t matter if you’re remodelling the entire lighting system or just having a few bulbs or wires changed, we take on any job big or small. We’re here to design electrical systems and help you choose the right outlets and switches too. You don’t want to wait until after you’ve built your new house to realize the outlets are not in a convenient spot! That’s why having great design is so important. We do commercial electrical projects as well and pride ourselves on being up to date with the greater expertise needed for these projects. Our electricians are always updating their skill set and learning about new technology. Whenever the electrical code changes, a lot of businesses find it confusing to know if they’ve kept up with all the changes. With us on hand you’ll be sure that you’re in compliance. All of our projects come with a 100% guarantee of satisfaction. We will remain on the job until you are full satisfied and we’ll even come back and fix anything in future that you have problems with. We believe our projects should be flawless and our satisfaction guarantee reflects this.